Month of May is a very busy month for a lot of people. It's enough to make your head spin. Yikes! Somewhere in the month's busy scheduled activities, I had to find some much needed time for getting some cards made for the special celebrations happening on Memorial Weekend.... Wedding and two graduations. 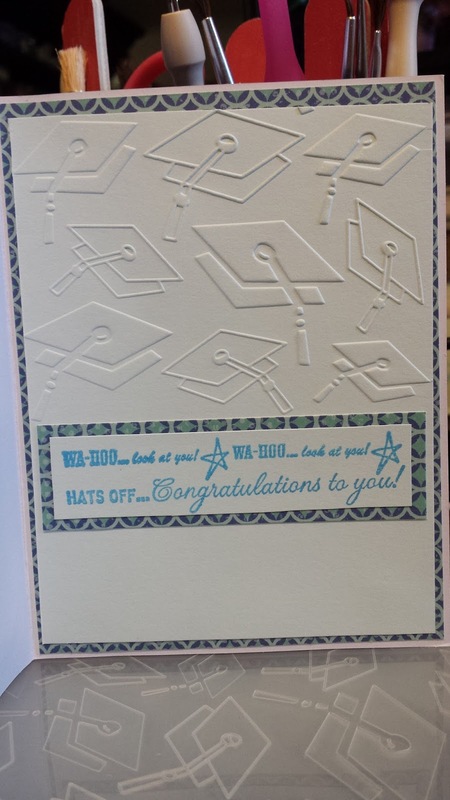 Since the graduations were for two sons in same family, I kept it so both cards had same card design and layout. 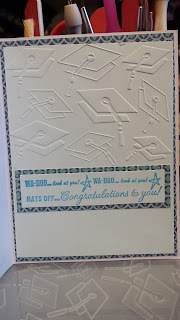 On the front of the Graduation Cards I kept it simple with using the Darice Graduation Embossing Folder on light blue paper that coordinated with the design paper and blue card stock background/card. I found some ribbon which had a Congrats Grad! Hats off!! sentiment on it which I put on top of another ribbon with same colors to set off the 1st ribbon as well as giving card another dimension to card. 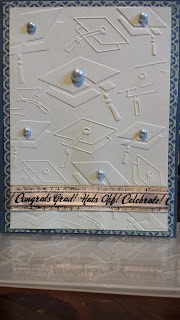 The card was still lacking something something, so I added pearls since I did not have sequence or bling in blue color. I tried to make it work.....not exactly what I wanted to use but it'll have to do. 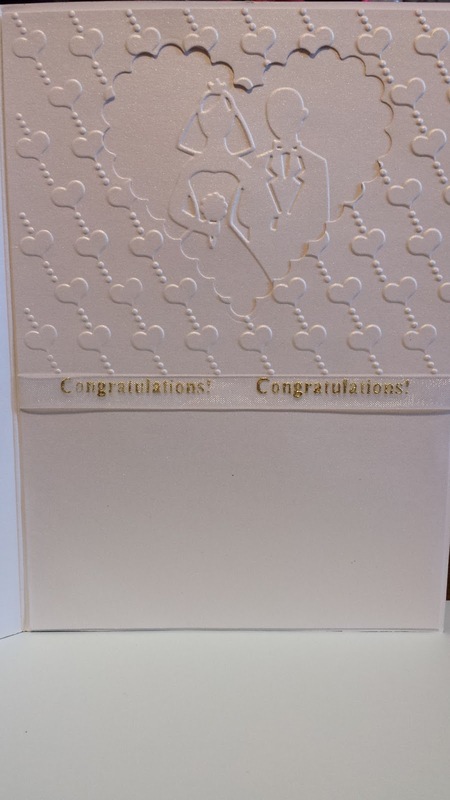 The inside of the card has the same embossed design on top portion of the card. Two sentiments from the Autumn Leaves Borders Celebrations Stamp Set. These two sentiments seemed to match up well with the sentiment on ribbon on the front of the card. The two sentiments were inked up with the Brilliance Pigment Ink in Pearlescent Sky Blue. I love the color and sparkle it gives! 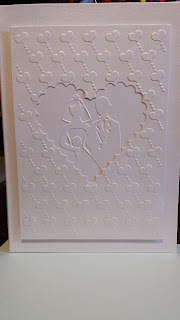 For the Wedding Card, I used the Darice's Heart Background Embossing folder as the layered background. One of the Spellbinder's Nestabilities Scalloped Hearts to cut a window in the middle of the layered background. 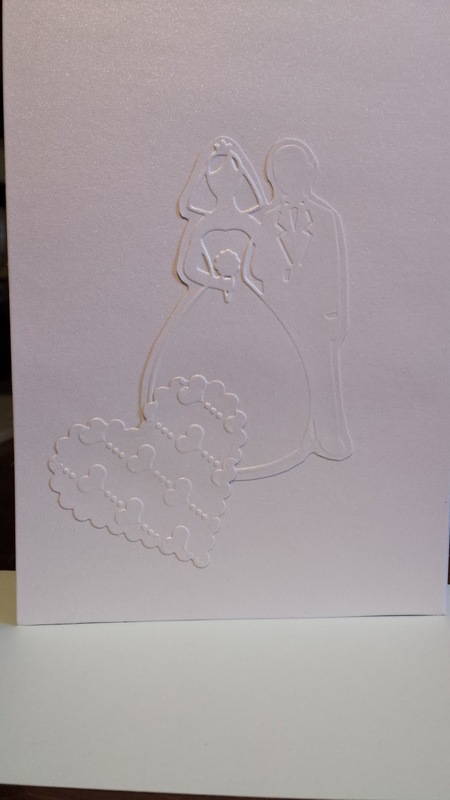 And within the heart window opening is a Bride and Groom which was made from the Darice's Bride and Groom Embossing folder. 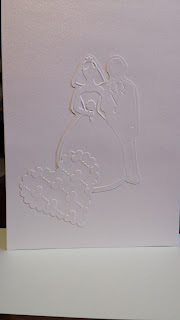 The card stock as well as the layered embossed pieces of the card were done from a shiny shimmery white card stock. 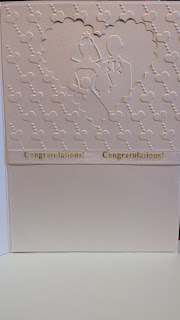 The camera could not even show the true beautiful and elegant look the shiny shimmery cardstock layers gave this card. I was so in love with the design layout, that I repeated the design on the inside of the card. I put a decorative Congratulations ribbon at the bottom of the design layout. And again I thought I would use up some leftover pieces I had on the back of the card too. Thanks so much for stopping in to view the newest creations. I hope you like and enjoyed them. I hope you have a happy scrappy day!